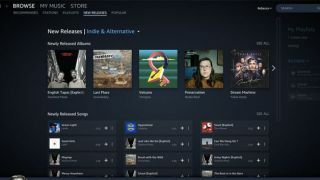 Amazon tipped to launch free, ad-supported music streaming tier | What Hi-Fi? Amazon is preparing to introduce a free, ad-supported music streaming service tier, according to an exclusive report by Billboard. 'Sources familiar with the plan' reportedly told the publication that the free service would offer users a limited catalogue of songs (like Amazon Prime Music, then? ), and could be available as early as next week. A completely free service would theoretically allow Amazon Echo smart speaker owners to ask Alexa to stream music without having to pay for any subscription. Amazon currently has two paid-for music streaming offerings: Prime Music – which offers a few million songs and comes bundled with Prime Video, Prime Reading and free next-day delivery for £7.99/$12.99 per month – and Music Unlimited, which is a standalone, more traditional Spotify-rivalling music service offering over 40 million songs for £9.99/$9.99 per month (or only £3.99/$3.99 per month on a single Echo device). While such a move would certainly indicate the company's competitive capacity to further challenge Spotify's subscriber numbers, it could also emerge as a double victory for Amazon in encouraging more people to purchase its Echo hardware. If Billboard's sources are correct, we could have confirmation soon after Easter.